Nalboor Tiles Marble White Marble Flooring: Bianco Dolomiti, Vanilla Oro and More! White Marble Flooring: Bianco Dolomiti, Vanilla Oro and More! Give your project the perfect look with luxurious white marble. While you may think that one white marble looks the same as another, you couldn’t be further from the truth. There are different undertones at play, various looks with the striations, and different veining levels. 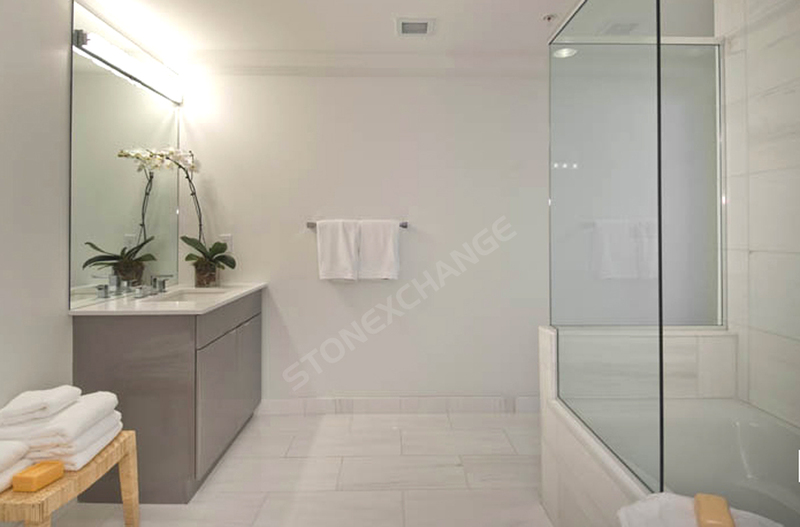 While Marmo glass can give you the perfect white finish without any color variation, you may want to go with natural marble for some visual movement and a truly stunning look. Here are just a few of the options available from Nalboor, and you’ll appreciate our excellent pricing and quality stones. This stone has a brilliant white color to it with a slightly milky finish. The sleek grey lines are in the background and seem to recede from view. Striations are very slight so that they don’t overwhelm the finished look or take anything away from the pure colors you’re trying to achieve. It’s comparable to Bianco Venantino Marble and Calcatta Gold Marble tiles that are imported direct from Italy, but they’re only a fraction of the price. It’s used extensively in five-star hotels and resorts around the world, and you can find it in everything from bathrooms and lobbies to grand ballrooms. In your own home or domestic project, it’s the ideal choice for an elegant powder room, welcoming sun room or even as a new kitchen floor. While you could order the name brands from Italy and pay a small fortune, you’ll find that our Bianco Dolomiti tiles provide you with all of the beauty at a much lower price point. Our pricing works on a sliding scale, and your savings will increase along with your order size. This is why it’s ideal to place one large order for all of your projects and simply store your tiles on site until you’re ready to use them. This marble will shift slightly in color from white to beige or cream, and that makes if the perfect choice if you’re trying to make a large space feel warmer and more welcoming. There may be some grey tint to the background, and this makes it a fine choice for contemporary homes where there are black accents or other bold colors at play. The veining can range in color from classic gold to a subtle yellow, so it doesn’t feel quite as sterile as some marble options. One of the reasons marble is such a popular choice is because it is naturally resistant to bacteria. This is why it’s commonly used in hospitals, schools, and long-term care facilities. Whether you want it for a residential kitchen project or you’re working on a fine hotel, marble is a great choice when you have an interest in slowing the spread of germs and illnesses. It will also look amazing in almost any application, and it’s durable enough to last through decades of regular use. This marble isn’t a pure white, but the soft beige and cream tones are still in high demand among designers. It has excellent background consistency with few veins and fills. The background colors can range from yellowish shades to gold and even some red, and that gives every stone a unique look that most designers love. Quarried in Turkey, it’s been used around the world to create a luxurious look that’s suitable for modern or contemporary design. It’s one of the most popular choices because it carries a lower price point than Bianco Dolomiti or Vanilla Oro stones, and it can add a beautiful touch to any room. We’re proud to offer several different sizes, including 12”x12” squares, 18”x18” squares, and 24”x24” squares. However, we don’t limit your choices to these simple sizes. We’re also pleased to offer special order options so that you can order tiles that perfectly suit your needs. We put the same care and attention into special orders as we do our regular inventory, so we do ask that you allow a few weeks to have our order filled. However, you can count on receiving the same impressive quality and excellent prices that we offer on our regular inventory. Champagne White Limra limestone may not have the same composition as marble, but it does have a gorgeous white finish. The color ranges from white to cream, and it can be used for interior and exterior applications. The consistent color makes it a great choice for areas where you don’t want to introduce the contrasting shades found in veining, and it features very affordable prices. Many homeowners love the look of white limestone on their patio or front porch, and you can also use it in your bathroom or foyer inside the home. Limestone is more porous than marble, so sealing this product is a necessity. In addition to offering tiles, we also sell the products you need for cleaning and sealing the stones to keep them looking amazing. When you place an order for your building materials, you can also speak with our knowledgeable representatives about sealers, cleaners and other supplies. There’s no doubt that adding white tile to your project can make it more appealing. Whether it’s going into your personal home or being incorporated into a client’s design, you’ll be pleased with the finished look. Marble is a durable choice that can withstand daily use and regular traffic. It’s easy to keep them clean, and you can find the perfect look for any décor. Whether you want true white with minimal veining or you like the idea of some background color, Nalboor has the stones you’re looking for. Our rates are the best and we take pride in our great customer service. We’ll pay close attention to detail with your order and as we package the tiles because we want you to be completely pleased with our service. Contact us today to order items directly from our inventory or to have tiles custom cut for your pending project.